This week’s Gospel lesson, Luke 13: 1-9, is, on first reading, baffling. Or at least it was to me. What does it mean that those who died were undeserving of their fate – the sudden, terrifying death that befell them and the gut-wrenching pain and hopelessness that must have seized their loved ones when they were killed – and yet the same fate will befall those who do not repent? If they were undeserving, what is the need for repentance? Isn’t repentance the act of one who is guilty and seeking to make reparation? Why is Jesus saying “They didn’t deserve to die, but unless you repent, you will die too”? If they didn’t deserve to die, and if we do not deserve to die, what need do we have of repentance? And how will it keep us from suffering an undeserved, sudden death, when such deaths were out of the control of those who suffered them and will be out of our own control as well? It’s baffling… unless we shift our entire understanding. Our understanding not only of death, but of life. Our understanding of sacrifice and mercy. Our understanding of human purpose. Our understanding of God. Pilate mingled the blood of some Galileans with their sacrifices. Pilate killed worshipers who had made their sacrifices in the Temple. At the time of the Passover, when so many had congregated, when the land was full and tensions were erupting, some were killed. And the crowds were asking Jesus what it meant. They were searching for meaning. Perhaps also for blame. Why didn’t their sacrifices protect them? What did they do wrong? Jesus basically says, “Nothing.” They did no worse than anyone else. He will not allow the crowds to think their death was deserved, any more than the death of those crushed by a falling tower is deserved. And yet our human minds long to find meaning, and so often turn to punishment and judgment and wrath. Even when death comes through a natural disaster or faulty architecture, we may be prone to look for an ultimate reason. Jesus says there is no ultimate reason… and yet if we do not repent – if we do not change our minds – death will come upon us in the same way. Death is inevitable. But if we change our understanding of death, it loses its grip upon our lives. What if we live knowing that death is not the ultimate expulsion, punishment, or shame? What if we do not live in fear of death, or in the grip of judgment – our own and that of others – that separates and kills? What if we live knowing that death is a transition, like birth, through which we all must pass? What if death became part of the fabric of human connection rather than separation? What if we lived not in fear but in joy and gratitude for the Love that eternally connects us to one another? How would it change our life, and our death, if we lived immersed not in sacrifice but in compassion and mercy? And what does all of this have to do with the story of a fig tree that doesn’t bear fruit, and a gardener who says to leave it alone for another year? What if the fig tree represents the Temple, and the gardener intends to nurture the tree with his own life? In light of the senseless massacre of Muslims worshipping in Christchurch, New Zealand, this scripture has a message not exclusive to Christians but open to all humanity. It is a message of living life not circumscribed by death, but opened by Love. This Love enfolds our Muslim sisters and brothers – those who find themselves in the comforting embrace of God in heaven and those who are comforted by God’s loving embrace as on earth they mourn the death of their loved ones. Only in Love does our death, and our life, have meaning. Only in Love is the cycle of sacrificial violence halted and transformed into a new, welcoming humanity living into its destiny as the embodiment of Love. We’ll talk about fig trees and Temples, Christ’s church and massacres in mosques, sacrifice and mercy, violence and our responsibility to transform it with love, at the next Girardian Virtual Bible Study. Please join us. One again, I have to thank Paul Neuchterlein and the Girardian Lectionary. The notes he took from Gil Balie and James Alison bring such a powerful perspective to this Gospel text. It’s about re-orienting our entire vision, and our entire way of being human, around the eternal, abundant life rooted in love that God opens to us through forgiveness. 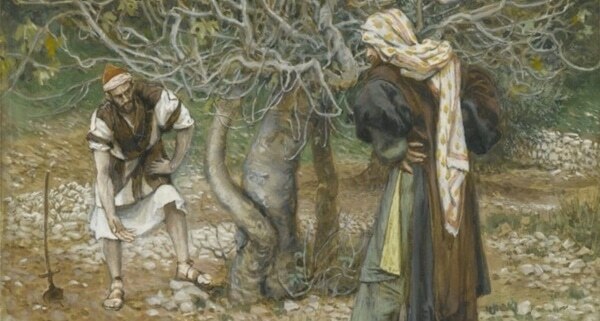 Image: Painting from the Brooklyn Museum: “The Vinedresser and the Fig Tree” by James Tissot. Public Domain.